Sunny July was a good month for the plants, most of them grew a lot. Here is how my little garden in Japan made it through the month. Summer flowers are in full bloom, the petunias, geraniums, marigolds, amaranth globe and others are doing amazing. Even the calla lily and the osteospermum give out a couple of unexpected flowers. The tomatoes gave a great harvest all month long, but sadly a heat wave got to them at the end of the month and almost kill them all. Now they are recovering slowly. Hopefully I will be able to get a couple more crops out of them before the season ends. The grape has grown very well. It really has loved the sunny days. It already formed a whole circle around the poles like it was intended. Everything is going according to the plan. I am expecting a lot of great fruit bearings for next year. The pumpkin finally started to give out some female flowers, unfortunately none of them has kept yet. I guess the plant is still not strong enough. Maybe in august we will have some, but the time is running out. A lot of growth in the strawberries. I think next year will definitely be much better than this. So far most of the balcony garden is doing well. Summer has made most of the plants grow very well but the heat has taken a bit of its toll too, still not enough to worry. I am wishing august will be as good. Bahçeniz çok şirin,benimde sizin gibi bir bahçem var çiçek ve meyve yetiştiriyorum.Emekli olduktan sonra bitkileri tanıtıp sevdirmenin yararlı olacağını düşündüm.Türkiye'den sevgiler. This summer is much cooler than the last summer when the record-high temp in some places in Japan. The cool temperature, actually we still feel it hot, help your tomatoes recovery. Fer - such great progress! I especially love the angle of your last photo. It is beautiful. You have the proverbial green thumb, Fer. 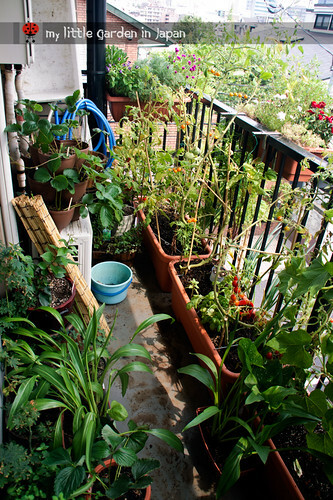 Your balcony garden rivals any traditional garden. I read your post on how you want to trellis your grape. I planted a grape vine this summer and I am still wondering how I will support it. I like your idea. How. did it work? Wow, so much has grown since I last visited. 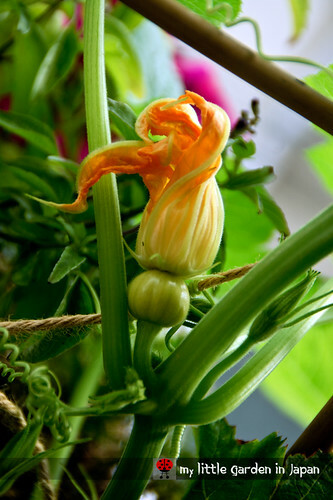 Your pumpkin flower is certainly turning into fruit. 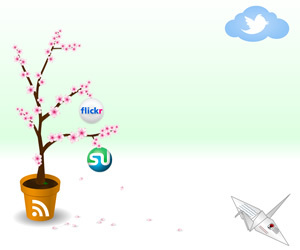 Wish you a good month for your plants this month. It's a jungle out there! I never cease to be amazed at what you can grow in a small space. fer, I'm thrilled to see the grapevine wandering it's way across your balconey. So wonderful to see how that worked for you. and pumpkins! Another plant I never would have thought to see on a balconey but you've made it work. I can't get over how you fit everything into your balcony. :-D I realize it is larger than your old balcony but still . . . Thanks to your help, my grape vine seems to be flourishing. Now I just need to see if it will bear fruit. I never fail to be amazed at how much you grow on your balcony! It's become a little farm! Sorry about your tomatoes. Have you ever tried self-watering pots? They keep the plants much moister than regular pots. So fast you've filled up your balcony with so many plants. 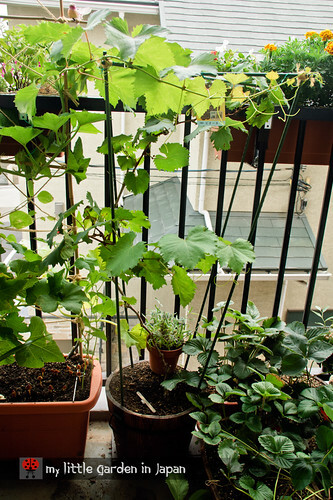 You even have grapes and pumpkin in the balcony!! That is really amazing. Such a beautiful flower and vegetable garden. Thank you very much! The garden is doing well so far. The hot summer keeps on taking its toll, but not too bad. Ann ~ The grape keeps on growing, now it reached the shape I wanted. Just have to wait for next year and hope for fruit. Casa mariposa ~ I do have been checking on selfwatering pots, maybe I will make some for next season. 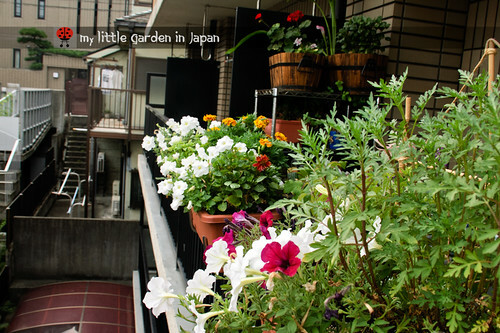 You did well for your balcony garden. Mine is not that good because of the heat. I suppose I haven;t watered them down more often. Congratulations on your garden. You did a very great job on the garden! It looks amazing and considering the lack of space... You're like a super gardener! 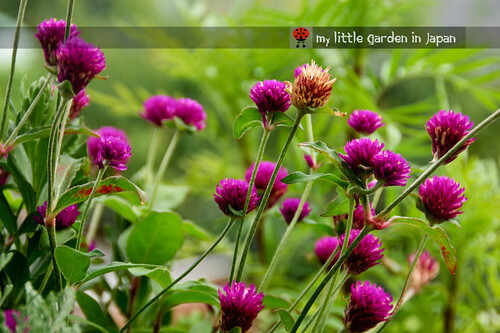 I hope this blog is still alive because is really an Inspiration to us gardeners without too much space.